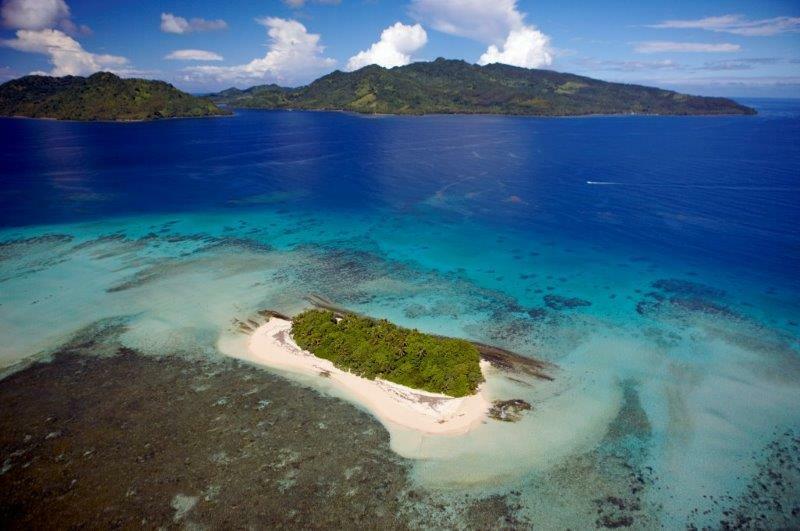 An amazing Fiji holiday escape awaits you at Nanuku Auberge Resort, Pacific Harbour. 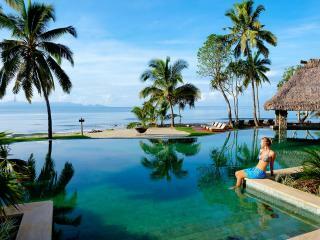 This luxury Fiji resort is set right on the beach overlooking the Pacific Ocean and surrounded by lush tropical gardens. Perfectly suited for special occasions including honeymoons or anniversaries, a family holiday or for an adventure packed holiday the resort is close to a wide range of activities including diving, snorkelling, zip lining, white water rafting, surfing and fishing. 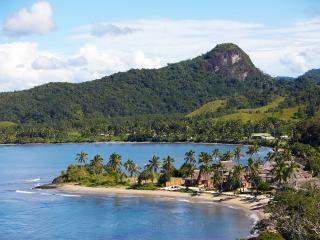 This Fiji accommodation has a selection of room choices that are suited to adults and those travelling with children. The luxury suites at Nanuku Auberge Resort are perfect for a romantic honeymoon or relaxing escape and not all cater to children. Families are well catered for in the residences and villas which are set in the tropical gardens and close to the waters edge. All rooms have been fitted with modern amenities and have been elegantly designed to ensure a comfortable stay. All rooms have a butler on hand who is more than happy to help out with guests requests. Nanuku Auberge Resort offers guests access to a fantastic range of facilities, services and activities including restaurants & bars, an infinity swimming pool, day spa & wellness centre, a gym, kid's club, library, games room, WiFi Internet, non motorised water sports, access to snorkelling, sailing, cooking classes and more. 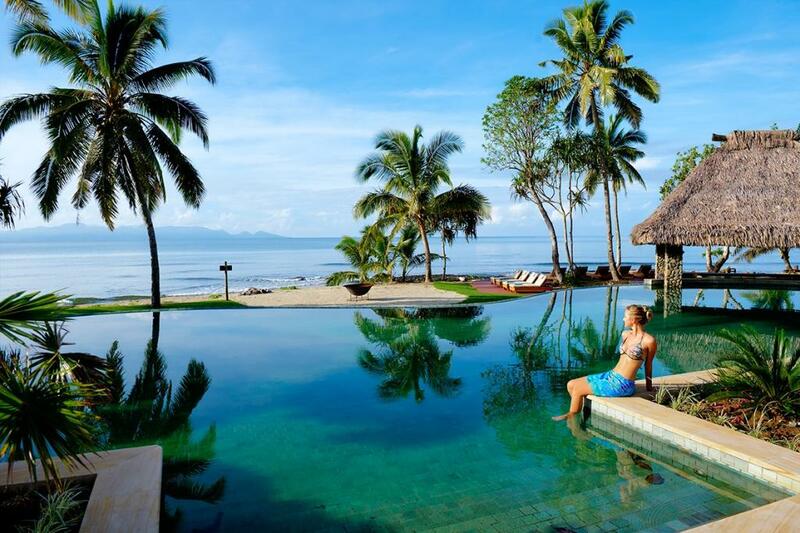 Spend each day in paradise at Nanuku Auberge Resort by doing as much or as little as your like. There are four types suites at Nanuku Auberge Resort to choose from. 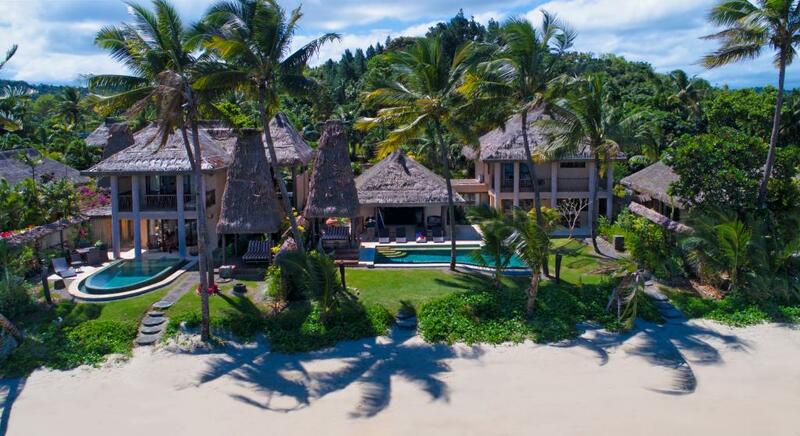 The Nanuku Suites enjoy beach access and tropical garden or ocean views, whilst the ground floor Beachfront Pool Suites offer a beachfront location and private plunge pool. Nanuku Suite: This room is the upper level of a 2 Bedroom Beachfront Duplex Pool Villa. Overlooks the beach and resort gardens. Bedding is 1 King Bed + 1 Single Divan Bed + 1 Sofa Bed. Maximum room capacity is 3 Adults OR 2 Adults + 2 Children. Beachfront Pool Suite: This room is the lower level of a 2 Bedroom Beachfront Duplex Pool Villa. Overlooks the beach and resort gardens. Bedding is 1 King Beds + 1 Single Divan & 1 Sofa Bed. Maximum room capacity is 3 Adults OR 2 Adults + 2 Children. 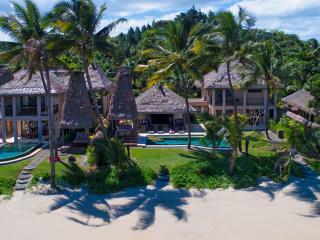 The villas and residences are perfect for adults and children and boasts a fantastic location right by the beach side. The expansive residences and villas are surrounded by lush tropical gardens and offers its' own private garden. Room configurations can be altered on request. 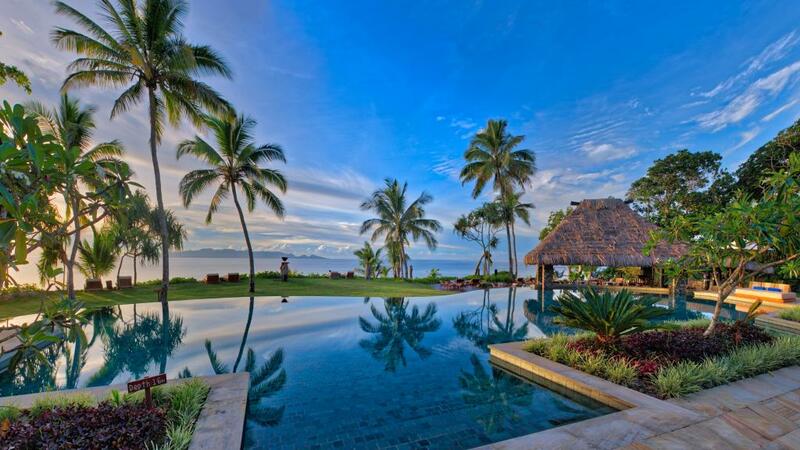 Beachfront Spa Villa: Overlooks the beach and resort gardens features a private spa. Bedding is 1 King Bed + 1 Single Divan + 1 Sofa Bed. Maximum room capacity is 3 Adults OR 2 Adults + 2 Children. 2 Bedroom Beachfront Duplex Pool Villa: Overlooks the beach and resort gardens features a private plunge pool and lounge bure. This is a two storey building with an external flight of stairs connecting the upper and lower levels. Bedding is 2 King Beds + 2 Single Divan Beds + 2 Sofa Beds. Maximum room capacity is 6 Adults OR 4 Adults + 4 Children. 1 Bedroom Beachfront Grand Pool Residence: Offers a spacious living and dining area with full kitchen facilities. The dining area opens to a horizon edge swimming pool. There is a media room with day beds, spa baths in two of the bathrooms plus one courtyard garden outdoor shower. Bedding is 1 King Bed + 3 Single Divan Beds + 1 Sofa Bed. Maximum room capacity is 3 Adults OR 2 Adults + 3 Children. 2 Bedroom Beachfront Grand Pool Residence: This is a combination of the 1 Bedroom Beachfront Grand Pool Residence and the Beachfront Spa Villa. Bedding is 2 King Beds + 4 Single Divan Beds + 1 Sofa Bed. Maximum room capacity is 6 Adults OR 4 Adults + 4 Children. There are a number of dining options available at Nanuku Auberge Resort, alternatively you can choose to have a private dining experience on your deck, by the pool or in the tropical gardens. 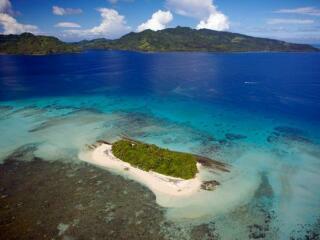 You can even have a picnic hamper created for you and be dropped off at the private Nanuku Island. Kanavata Restaurant & Bar: Set in an amazing location overlooking the Pacific Ocean, here you can taste amazing meals that have been created using local ingredients. A selection of local and imported beers plus a wide range of international wines are available. Sunset Deck and Bar: This is a great place to enjoy a relaxing mocktail or cocktail with friends or family. There is a BBQ grill where you can choose from a selection of meals or you can have the chef cook up your freshly cooked fish. Lomana Spa & Wellness Centre: Local and fresh ingredients are used in ancient methods while guests enjoy relaxing massages and treatments. All of the therapists at Lomana Spa & Wellness Centre are highly skilled and there are a range of treatments on offer including facials, massages, body soaks and much more. Couples massage lessons can also be arranged in your own private room. The Wellness Centre features a fitness instructor who is available to create a personal program that suits your lifestyle. Lailai Adventure Club: Nanuku Auberge Resort offers a fantastic Children's program which is educational and fun at the same time. The children will enjoy a range of games, water activities, crafts, cultural experience and more. Children 8 - 13 years have access to the Lailai Adventure Club with daily activity program 8am - 5pm. 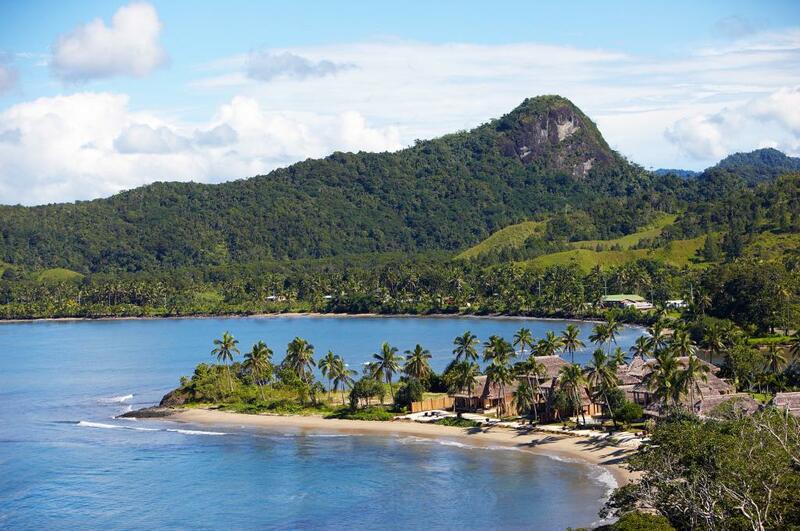 There are plenty of activities for Nanuku teenagers including hiking, cooking lessons, crafts, waterfall swims, Fijian music, surfing and more. 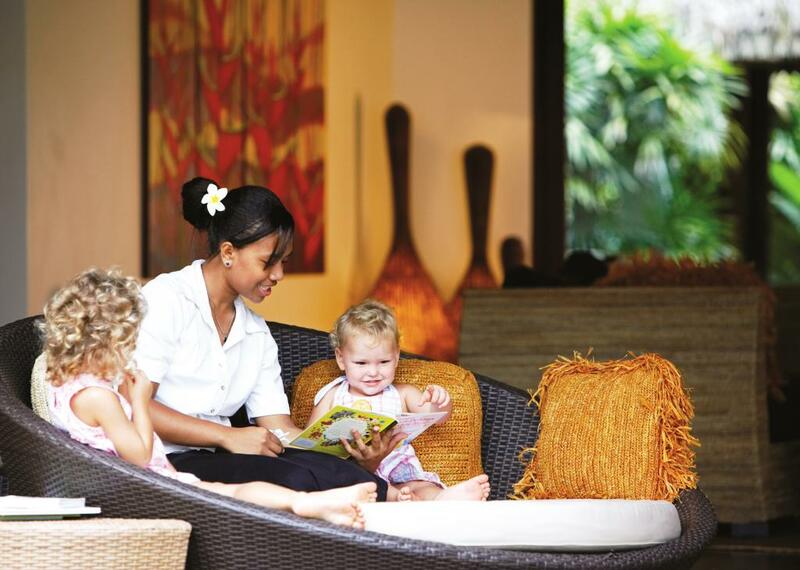 At Nankuku Resort each child that is 0 - 7 years will have an allocated nanny from 8am - 8pm each day. 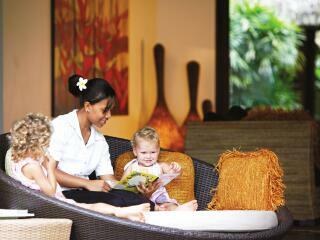 Hourly and overnight carers/nannies are available upon request and incur an extra charge payable direct to the resort. Children: Children are welcome however parents must sign a waiver for the responsibility & safety of their children. The accommodation has water ponds in the gardens, private swimming pools or are located on the beachfront. Children must be supervised by an adult at all times. Children 0-8 years of age stay and eat free, and children 9-13 years are charged the child rate.